What Do You Want To Know About The 2018 Ducati Scrambler Desert Sled? I will not be testing it this hard. The 2015 Ducati Scrambler raised all kinds of excitment when it came out by pretty much nailing a sweet spot between retro-styling, light adventure capability and the mystique associated with “Italianess” that people seem to find enticing. The slightly meatier ’18 Desert Sled should be all that and a little more rough-road ready. So what else do you want to know? 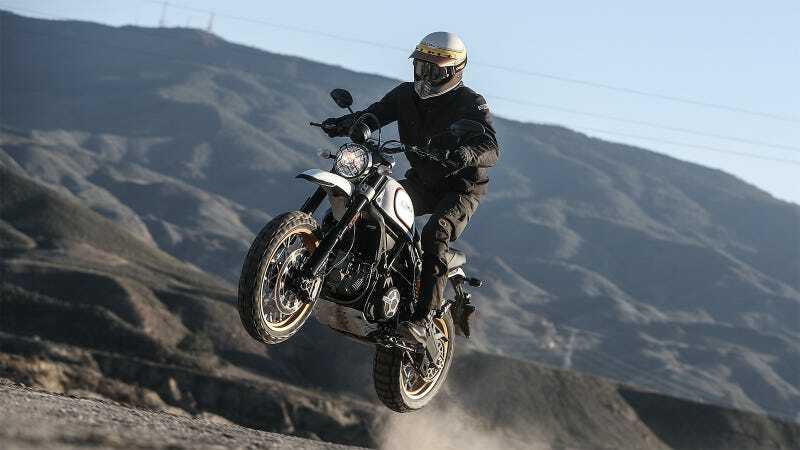 The Desert Sled shares a basic platform with the standard Scrambler but the suspension, wheels, design and geometry are all unique. I’ve just collected one of these from an office in Beverly Hills and lanesplit my way back home to Culver City. So far I can only tell you that the bike feels easily physically manageable, has a great exhaust note, healthy-feeling torque, decidedly soft suspension and a lot more looseness to it than I was expecting. That’s not to say the bike is unresponsive, I guess what I mean is, it actually feels more like an off-roader than an upright touring bike. Alright, maybe I wasn’t entirely sure what to expect. The version I’m on, the Scrambler 800, runs a twin-cylinder engine rated to 75 horsepower paired with a six-speed transmission. The Pirelli tires it comes with are pretty beefy and loud, but I expect they’ll provide some decent traction when I hit the dirt. I’m looking forward to testing it more completely on Angeles Crest, dirt roads of Angeles National Forest, and I just might have to haul it all the way out to the desert this weekend. It is called the Desert Sled, not the Beverly Hills Sled, after all. We’ll have a complete writeup in the near future. Meanwhile, does anyone have any questions about this machine that I might be able to answer?